For me, Star Wars fever is a chronic disease so you’ll always find me looking forward to the next canon novel release. I’m especially excited about this one though, for a couple of reasons. Captain Phasma is a fascinating character but little is known about her, and her appearances in the new official canon so far have been very brief and few. Even the book’s description is frustratingly vague, so this should be very interesting indeed. Second, I’m a fan of Delilah S. Dawson, and this is her first full-length Star Wars novel. After the great fun I had with her short story Star Wars: The Perfect Weapon, I’m looking forward to reading more of her work in this universe. 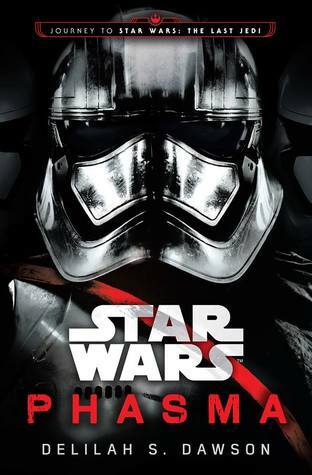 “Discover Captain Phasma’s mysterious history in this Journey to Star Wars: The Last Jedi novel. Yeah Phasma seems like someone they ahd big plans for but either haven’t had time to develop or just didn’t go with it, I don’t know. Hope this one is a good intro to her character! Yeah, I’m hoping we’ll get to see her more in the books and movies and games or anything! The prequels were awful. Just plain bad. You should check out The Force Awakens and Rogue One if you get the chance though, whatever flaws they may have, at least they are leagues better than Episodes 1-3! Nice! Hope you enjoy this one once you get it! I haven’t read much of the new expanded universe novels, but I liked her character, and I am intrigued by what little we do know about her. For instance, her armor is supposed to be made from the wreckage of Queen Amidala’s ship? Is there another connection there? I might give this a read to see what backstory they’ve given her. I don’t read Star Wars books but I have read a few things by this author and really enjoyed them. Hope you love this one. The cover is AWESOME! I’m not that into the Star Wars cannon but I have a feeling if I started it would be hard to stop. I love the idea of a story based around a “mystery” character! Oooo! I saw the author tweet about this book recently and I was like whaaaaaat??? I had no idea this book was a thing. I hope you enjoy it when you get the chance to read it! Haha, well, I guess it’s only a big thing for us Star Wars fans. 🙂 Can’t wait for this one! Agreed! I heard that Christie really wanted to be in the movie and they tweaked the Phasma character for her, as the role was originally intended to be played by a male actor. Her talent is definitely wasted behind the armor and mask though, but I’ve heard rumors she’ll have a bigger role in The Last Jedi! I haven’t read any Star Wars books yet, but I do really like both Captain Phasma AND Delilah S. Dawson, so I’m intrigued! I haven’t read any Star Wars books but I hope you enjoy this – you’re clearly eagerly anticipating it and it’s a great cover too.